What is almost universally assumed in these discussions is that stay-at-home dads are new. They aren’t. The so-called traditional notion of a father’s place being out in the world, bringing in an income, while the mother nurtures children into young adulthood developed in the western world alongside the industrial revolution, as new opportunities pulled many men out of the home and into offices. American and European periodicals and fiction from the first half of the nineteenth century responded to rapid and sometimes unsettling economic changes with idealized, comforting images of the mother as an “angel of the house” and the father as a confident breadwinner. The overwhelming ubiquity of such images has taught us to view these projections as “traditional,” universal roles. It seems to make intuitive sense: only women can bear children and breastfeed babies, after all. But the rest of childcare can, and over time often has, been done by others: servants, relatives, friends, neighbors, and sometimes fathers. In the middle of the nineteenth century when images of idealized domesticity were most broadly promoted—when it was, in most parts of Europe and America, most costly for men or women to openly act against type—we still find men who loved being fathers and women who had ambitions in the public sphere. But do we see an actual stay-at-home dad who does not work outside the home, and who spends years nurturing his children while his wife brings home the bacon? As it turns out — yes. But to find him we do need to leave the middle-classes of western Europe and America. Those societies had restrictive property laws that prevented most married women from managing property on their own and inhibited women’s opportunities outside homemaking. At the same time, those societies enjoyed booming industrial economies where men could earn a good income in a great variety of occupations. In Imperial Russia, by contrast, women enjoyed the right to manage their own property, and there was no commercial middle class in the western sense. A large majority of the Russian population were peasants, many of them enserfed. Nobles handled the government apparatus and the management of those vast peasant-filled lands. But very few Russian nobles were like the people you see in the latest remake of Anna Karenina, waltzing around ballrooms dripping jewels and getting entangled in sticky love affairs. The majority had only small to modest incomes. Middling-income nobles often struggled to make ends meet for their serf dependents as well as for themselves. 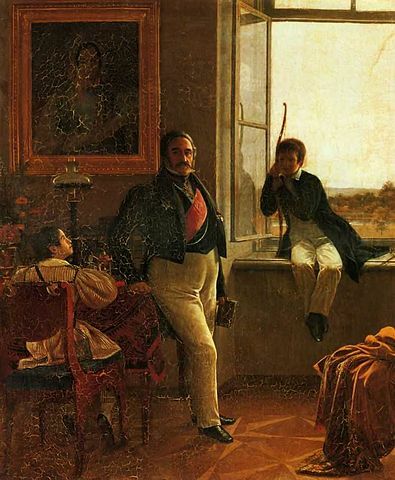 One such Russian nobleman, Andrei Chikhachev, kept a diary about raising his two children. After his children were older, he wrote to newspapers about how ideally he and his wife had arranged their affairs, and argued that their peers who were not doing the same already should strive to do so. Портрет А.С.Лошкарева с детьми. Крендовский Евграф Федорович. Via Wikimedia Commons. While she was doing this, Andrei taught their two children their lessons up to the age of twelve, when they went to Moscow for formal schooling. He played with the children, invented games for them, and doted over their progress. He also carried out a rigorous program of self-study to qualify himself to instruct the children in catechism, history, geography, literature, and French (while an uncle taught them mathematics and tutors were brought in for German and Latin). Childrearing was Andrei’s vocation, and far from being emasculated by it, he wrote of it as the ideal masculine role. He reasoned that raising a child was an intellectual and moral task, which is to say, an abstract task. Abstract thinking was, in Andrei’s mind, both inherently masculine, and existed outside the home in the metaphorical sense. While Natalia managed complex finances and gave Andrei an allowance, her work remained practical and within the “home” (which they understood as encompassing their scattered agricultural estates). Thus even through a mid-nineteenth century lens colored by the literature of domesticity, Andrei could understand his wife’s financial and management role as ideally feminine, and his own nurturing role as ideally masculine. While Andrei and Natalia’s arrangement may not have been precisely typical, their friends and neighbors found nothing in it to raise their eyebrows about, which is a striking contrast to the attitudes of comparable privileged classes in, say, England or the United States in the same period. And given the fact that many Russian women did manage their own property, the arrangement may not have been as unusual as we think. The Chikhachevs likely came to their roles from the same reasons that some men are choosing to be stay-at-home-dads today; they were in debt and their society offered few lucrative opportunities for Andrei, but little in the way of obstacles to Natalia. The Chikhachevs’ story tells us, if nothing else, that the Victorian stereotype was always just a stereotype, and after two hundred years we can perhaps finally put it aside, and embrace a more flexible reality. 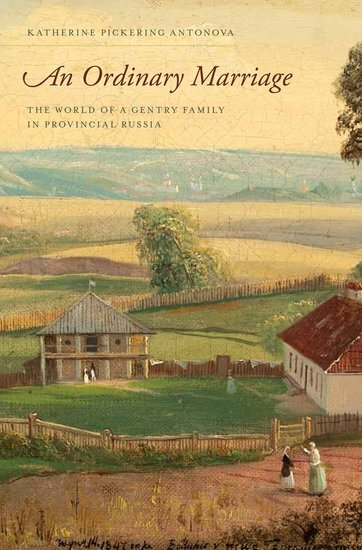 Katherine Pickering Antonova is the author of a microhistory about the Chikhachev family, An Ordinary Marriage: The World of a Gentry Family in Provincial Russia. She teaches Russian history at Queens College, City University of New York. Read Katherine Pickering Antonova’s blog.